The creme de la creme of this ritzy hood is this absolute beachfront seven-bedroom beauty. Villa Gajah Putih. Set on a giant four acres of beachfront land with its own tennis court, home cinema, resort-sized swimming pool, expansive lawns, coconut grove, and 20 staff, including an in-house chef from 7am to 10pm each day. 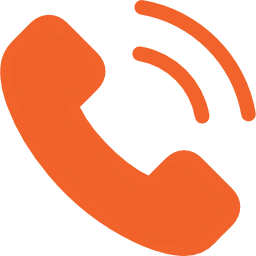 It also boasts a full-time concierge to book tours, arrange restaurants, and any other activity – making sure everything outside your villa is just as perfect for your Bali villa holiday in Canggu. Grand is an understatement for this idyllic property. Grab some friends and live like celebrities in a once-in-a-lifetime destination. Find out more about Villa Gaja Puti. 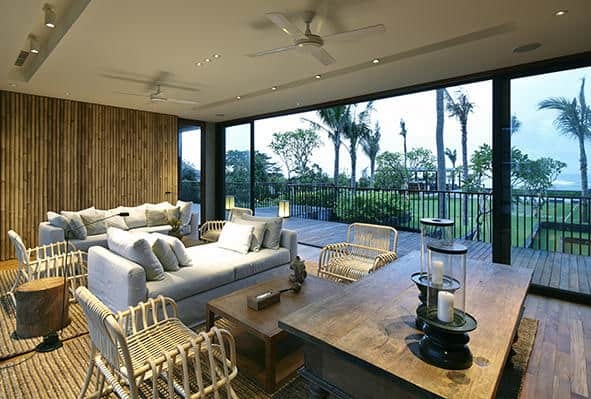 Award winning Singapore architects CSYA, masters at tropical living, were commissioned to design this stunning five-bedroom villa overlooking Echo beach. In Sanskrit, Villa Arnalaya means ‘rhythm of the waves’ so it’s not surprising this property has a sense of balance and calm. That’s how guests feel in the magnificent gardens; the perfect platform to absorb the stunning ocean views. Each of the five bedroom is 55-60sqm with four-poster beds, Bose ceiling speakers, hidden TV and Hansgrohe fixtures. You’ll never be bored with spa, gym, games room, and a tennis court. See all the details for Villa Jagaditha. Situated in Batu Belig village, this four-bedroom villa offers stunning sunsets and the perfect location for a Bali wedding. 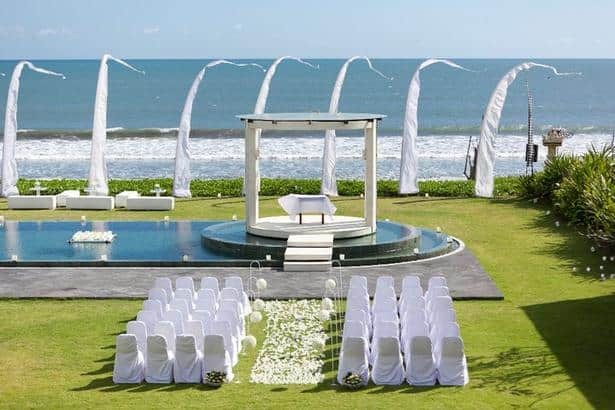 Clean, modern lines and and unique architecture, your magical day will seem to have the influence of your own art director – great for all those romantic pix. There are four bedrooms, and plenty of room for wedding guests to relax along with the perfect platform to exchange vows. See all the details for Villa Phalosa. On seven square kilometres in the village of Beraban, this three-bedroom is accessed through terraces of rice paddies to offer true privacy and beachfront. Close to the Tantangan River with its bird and wildlife, this villa is at its best with the morning sunrise. The landscaping is by John Pettigrew, celebrated for the many grand private residences and resort gardens he has designed. A unique dry garden with stone landscaping and rare cacti is a particularly wonderful feature. This villa is also completely off the grid to make it one of the most harmonious living spaces on the island. 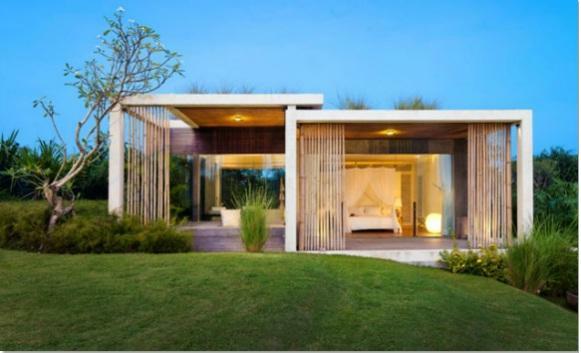 See more information on Villa Tantangan. 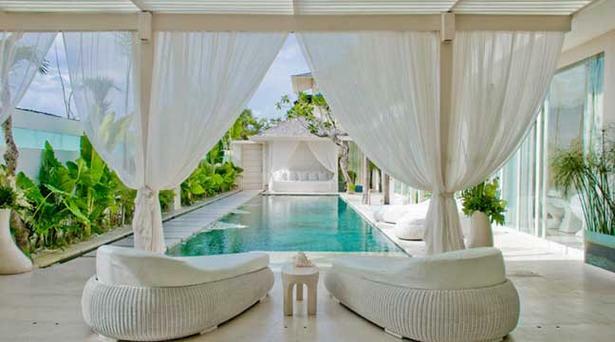 This all-white villa will appeal to the style conscious and anyone looking to calm the mind with pure surrounds. Sunken bathtubs, white concrete floors, air conditioning in all bedrooms ensures maximum relaxation. Only a 400m walk to Batu Belig Beach with a range of full-time staff, including a trained cook, you’ll never need to leave this glamorous neighbourhood. See more details for Villa Puro Blanco. 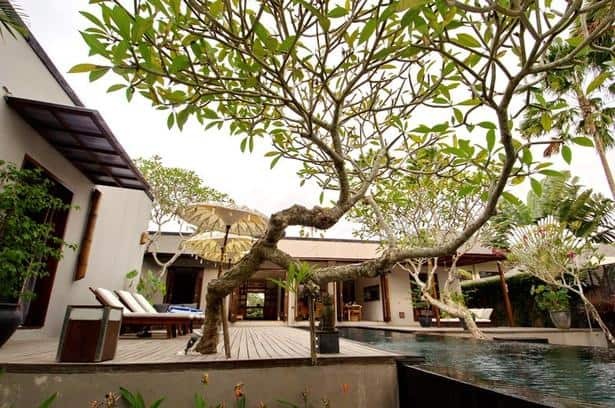 With the frangipani-fringed pool, a river running at one border of the property, rice paddy terraces surrounding, and 600m to Pererean Beach, this villa offers the best of Canggu. The three bedrooms can be turned into five with an interconnecting villa and has a great beachy feel, contemporary interiors and lots of polished concrete. See all the details for Villa Kotak.